Shock: The astronaut is right – for across the galaxy a giant alien is lining up a 50 groat bet to pot the ‘grey ball’ planet to the ‘top corner’. The moon is part of a giant game of pool! 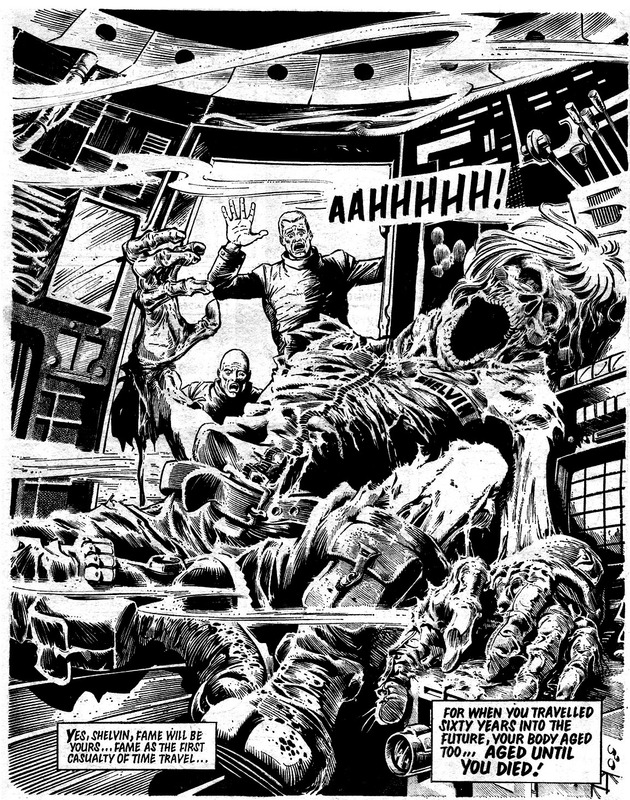 Thoughts: Kevin Gosnell, Starlord’s editor and editorial droid at 2000Ad from progs 17-85, was to turn out to be a bit of a master at writing Future Shocks and this initial effort, while relying on a deus-ex ‘shock’ in the final panel, is certainly a nice idea and despatched in a page and a half. Planets as pool balls is hardly a revolutionary concept, although again date wise 2000AD beats Douglas Adams to the gag. 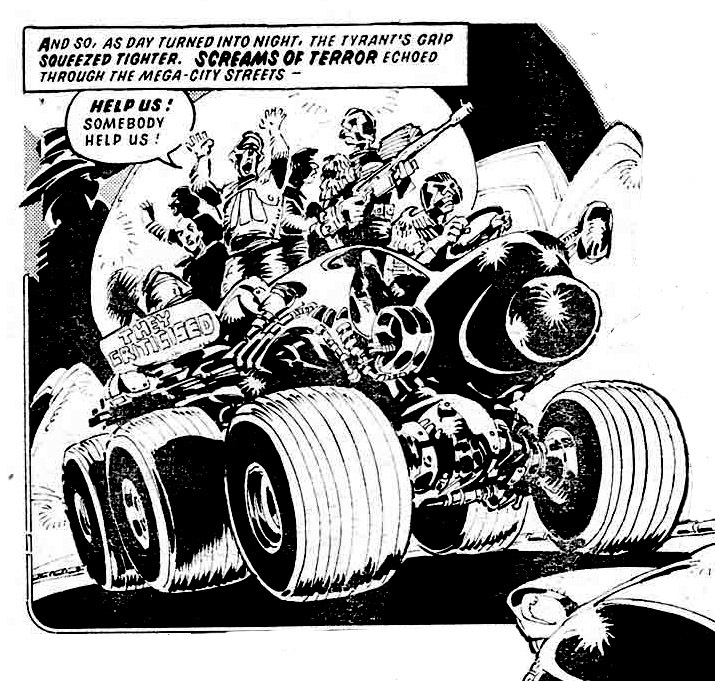 Given two of his Hitch-hikers routines have now been published in 2000AD during the time he would have been formulating and writing the initial radio scripts for Hitch-hikers it is interesting to note the overlap. 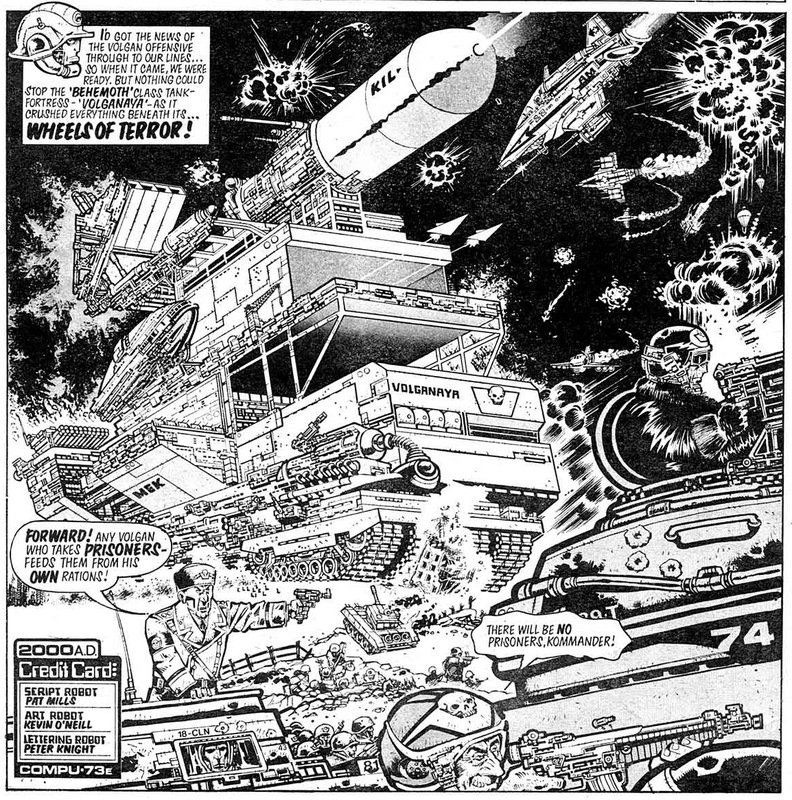 The Future Shock will be of primary interest as another early art outing for Kev O’Neil and some of his trade-mark touches are in evidence – notably the space vehicles are precursors to the style on Ro-Busters and Nemesis. The most enjoyable aspect of the strip are the panel breakdowns which are all over the place but accommodating of the narrative flow of the story – making the main page a very accomplished piece of eye-candy. Shock’d? After a series of Future Shocks that try to tie the shock into the story Play Pool! is a return to the less satisfying format of a completely left-field event happening in the final panel. As the strip is no-more than an extended one panel gag it can be forgiven that any shock is simply due to the punchline being so abruptly inserted. Shock : K Trel lands the plane and is assisted by a ground crew that consists of a chimp and a tiger because K Trel is a kestrel. Born to fly, fight and kill. Thoughts: If there was an example of a Future Shock to which time has not been kind to then, on first viewing, Kev O’Neil’s ‘Wings’ is such. A rare outing as a script droid, and an even rarer one away from humour scripting such as Dash Decent and Bonjo, O’Neil’s page and a half has a simple ‘shock’ to deliver and does it with the minimum of fuss. 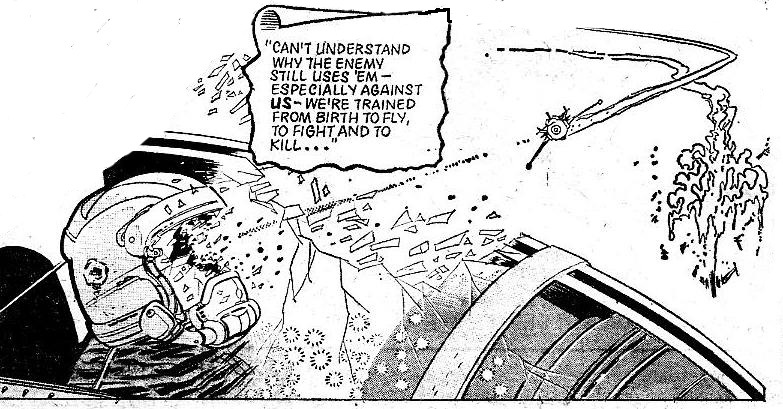 Like the previous week’s Shock, First Contact, the kicker is all in the visuals of the final panel; however what precedes it isn’t as sophisticated or interesting as Hebden’s excellent story. There is a bad pun name K Trel / Kestrel and the hint line of being ‘born to do it’ but aside from that the delivery is all in the final Panel of K Trel flying out of the cockpit while talking to the anthropomorphic ground crew. Sadly the art in that panel is easily the worst thing in the strip as O’Neil tries to draw realistic animals instead of in his own distinctive style that has featured in the preceding panels. 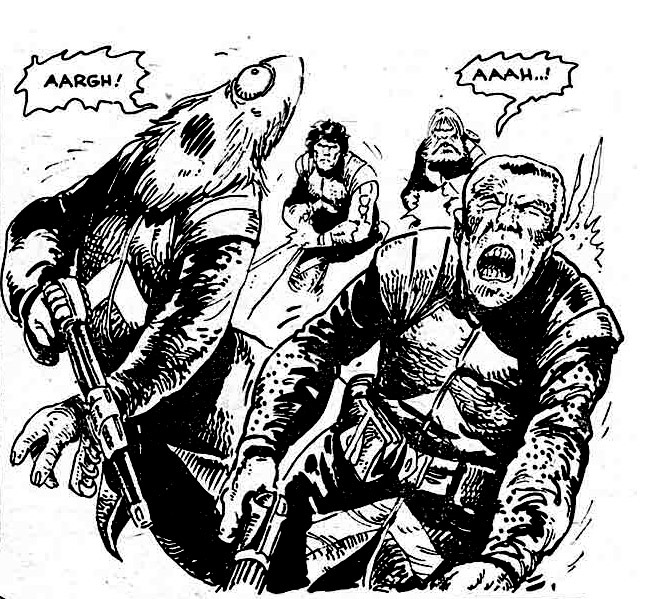 However given that 2000AD was a young kids comic and considering ‘future war where animals do men’s fighting’ has been the highly successful basis for both Paul Cornell’s XTNCT and Dan Abnett’s KINGDOM the idea deserves a kindness in re-analysis. There are a few panels of that much admired unique O’Neil style and K Trel is clearly the spiritual pun-father of Gene The Hackman. However the highly critical will wonder why K Trel needed to wear a humanoid helmet and flight suit, the unnecessary appearance of which does undermine the final reveal. Shock’d? More ‘WTF”d’ than ‘shocked’. The tiny kestrel shooting out of a huge traditional cockpit is just a bizarre image and completely illogical but the story has given us a few pointers, if more of the type that only become apparent after the final reveal than clever points building the story. A qualified shock undermined by the Johnny Morris look to the animals.